Our First Iowa State Park. 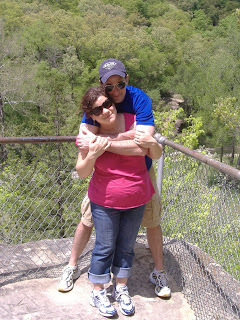 On Saturday we enjoyed a day outside at Ledges State Park north of Des Moines. Our friends the Ramseys (native Iowans) served as our tour guides for the day. We loved the chance to picnic, throw the frisbee, and hike on the trails. We were so thrilled to be outside in perfect weather (70 degrees) in the middle of May. In Texas, it's already 95 degrees...definitely not hiking weather for pregnant ladies! So far, Spring in Iowa has proved to be quite pleasant. It may have taken a while to get here, but it is welcome to stay! Our native tour guides, the Ramseys. Don't be jealous of my super-cool hiking outfit.